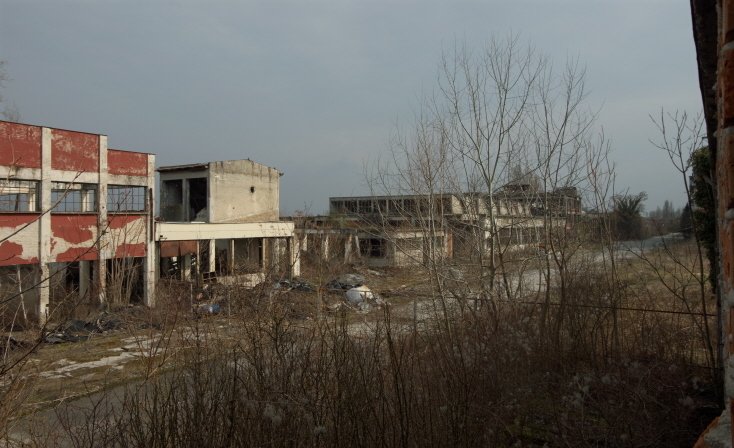 A largely abandoned and war-ruined factory complex to the north of Vukovar, eastern Croatia. Parts of this lend themselves to some urban exploration, as I found when I was there in March 2018. More background info: Borovo is a village on the banks of the Danube north of Vukovar. The old village, Borovo selo, dates back to the Middle Ages, but the newer borough of Borovo Naselje only came into existence due to the large rubber and shoe factory set up between old Borovo and Vukovar in 1931. These were originally part of the Bata shoe-manufacturing empire (named after its Czech founder Thomas Bat'a who also set up factories in the USA and all over Europe). A whole new housing complex was also built to accommodate the factory's workforce. After WWII, during the Yugoslav socialist era the factory was nationalized and the brand name Borovo for shoes produced here replaced the Bata label (although I've read somewhere a few years back that the factory also continued to make shoes under that label for export – but I cannot find a reference for that any more). In its heyday, the factory employed some 23,000 people and churned out 23 million pairs of shoes annually. In short, it was an industrial giant. When in 1991 Yugoslavia began to break up, Borovo was one of the places where the earliest violent ethnic clashes happened. In early May there was some incident involving the replacement of the Yugoslav flag with the new Croatian one, in the course of which several Croatian policemen were killed in an ambush in Borovo. It was after this incident that the Yugoslav Army intervened. As Borovo was, and to large extent still is, mainly inhabited by Serbs, the residents there were opposed to the Croatian independence referendum of 19 May and mostly boycotted it. So when Croatia declared its secession from Yugoslavia, Borovo didn't go along, and tried to break away and align itself with Yugoslavia and newly created entities in the chaos that ensued. From there on the situation escalated and led to the Battle of Vukovar, the first large-scale operation of what was turning into the Homeland War and also the first full-on military confrontation in Europe since WWII – see under Vukovar and Croatia in general. 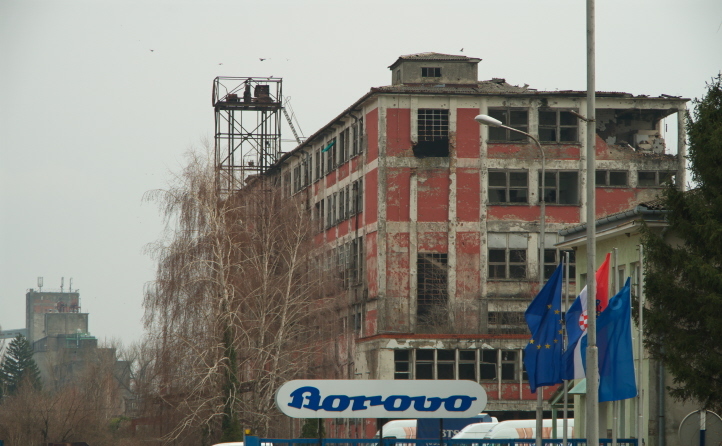 The Borovo factory suffered significant damage during the fighting. Not only were many of the plant's buildings destroyed by the shelling and fighting, but the adjacent residential districts also suffered. Moreover there have been large population shifts during and after the Homeland War (yet the Borovo district still has a large Serbian population). 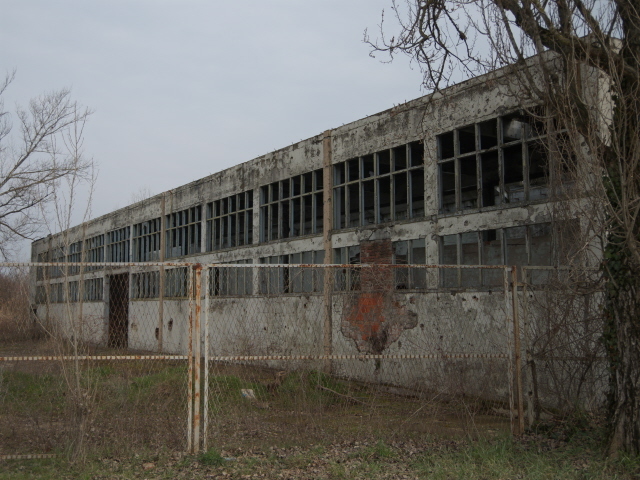 Today, only one of the large production buildings is still in use at the plant, the rest of the vast complex has been left more or less abandoned in its ruined state. These days only about 500 workers are employed at the factory, but their shoes have in recent years regained popularity, sales are up, and the company has been able to reduce its debt backlog. So it's not looking too grim. 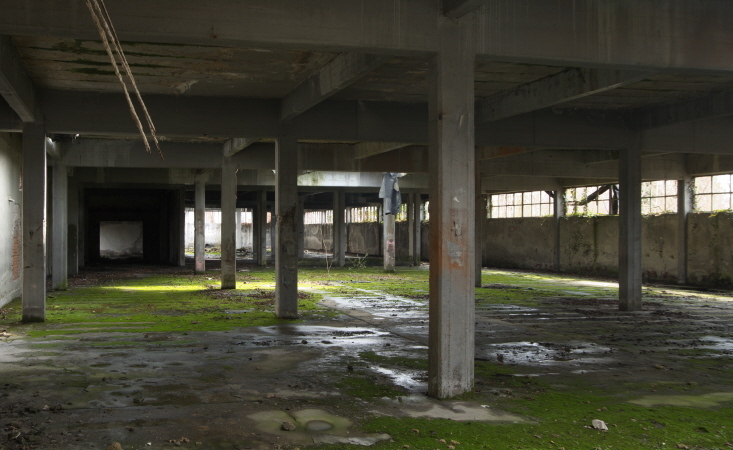 Yet the ruined parts of the factory are unlikely to be repaired and revived any time soon. So they still form part of the plethora of sites in and around Vukovar that stand as reminders of the Balkan wars period in the 1990s. What there is to see: When I went there (in March 2018) I first headed to the northern part of the complex, driving along the little track that's parallel to the river and the railway line. I first overshot the mark a bit, driving towards the old village of Borovo, so turned around and parked near the northernmost factory buildings, where I had spotted a rather large hole in the fence. I parked my car and went to inspect this hole. Indeed it was very easy to slip through here. 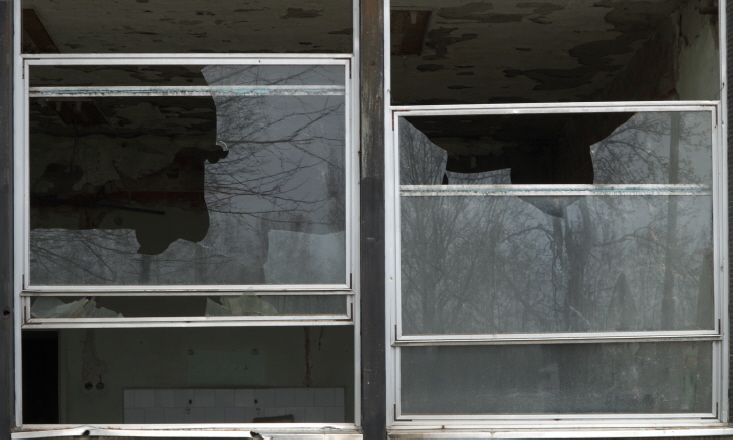 And soon enough I found myself in the first part of the abandoned factory buildings. Amongst the debris strewn about was also clear evidence of former shoemaking here. But mostly it was just rubble and junk. Yet such empty and abandoned factory halls have a certain aesthetics of their own. So I savoured this for a while and took photos, also heading to an upstairs part for a good view into the remainder of the factory and the middle sections. There was another, higher fence separating the latter, and on this one I didn't see any obvious holes to slip through. So I left it at exploring the northern buildings only. Such “urbexing” is of course best illustrated by photos rather than descriptive words, so I refer you to the photo gallery below. Afterwards I also drove along the little road parallel to the south of the factory complex. There were points from which to get good views inside (see, again, the photos), but I didn't see any more easy access points. Moreover, there had just been a change of shifts at the active part of the factory, and the road was busy with workers cycling home, so I felt too observed for any attempts at venturing in here as well. So I just drove to the end of this road – which ends abruptly in a little housing estate, so I then had to drive all the way back to the gate, from where I headed back to Vukovar. There is no commodification here, just atmospheric abandonedness and some war scars, but I found it well worth the little detour! Location: Some 2 ½ miles (4 km) north-west of Vukovar in eastern Croatia, but south of the actual old village of Borovo. Access and costs: Nominally none, but some parts are actually quite easy to get into; naturally for free. 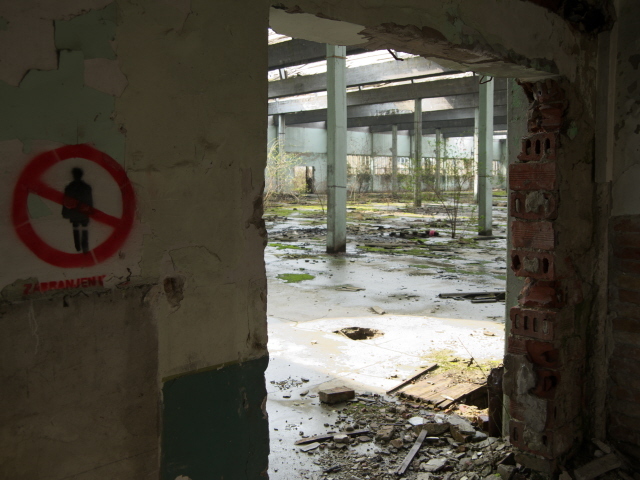 Details: The working part of the factory is not normally accessible for outsiders, and the abandoned parts of the factory complex are not nominally open to the public either. However, I found it quite easy to get into the northern parts (see locations), where I slipped through a large hole in the fence and explored freely without ever being bothered by anyone. I didn't even see any no trespassing signs on the outer fence, so the illegality of having a look around is probably quite limited. Needless to say there are no opening times or admission fees – it's just a little individual adventure off the beaten path. A spot of urbex. To get to the Borovo factory from Vukovar you'll need a car or bike. Head out of town on the main road leading north-west, Priljevo ul., past the harbour and the shopping centres, and at the roundabout, where the road to Vinkovci branches off instead take the first exit to the right. Go to the end of this road and turn right. You're now by the main factory gate. But since you can't use that (there's a guard and barrier) carry on north and take the dirt track that leads north along the eastern side of the railway line. Drive up for 250-300 yards and park there. This is where I found access to the northern part of the complex. The southern part is reached by the little road that heads south-east just to the south of the main gate. But here I didn't spot any easy access to the inside (but also no longer was I looking hard for one). Time required: Depends on how long you want to poke around those abandoned factory buildings and whether you're up to venturing beyond the not-so-easily overcome fences. Then you could probably have a couple of hours worth of adventures here. But about 45 minutes to an hour should be the minimum time allocated. Combinations with other dark destinations: in general see under Vukovar. The nearest other dark sites covered here are the Croatian Defenders Memorial and the abandoned grain silos. The former is reached by first driving through Borovo along Ul. Blage Zadre, turn left at the end of this, and at the roundabout coming up take the first exit and drive westwards on Trpinjska cesta and after half a mile the memorial comes up on your right. The abandoned grain silos are reached by taking the main No. 55 road, called Vinkovačka ul., which starts at the roundabout to the south-west of the Borovo factory. The nearest dark site within Vukovar proper is the memorial inside Vukovar Hospital, off the main road from Borovo to Vukovar centre.